Having ridden through parts of Montana twice in the past ten years, I knew I wanted to return this year. Arriving four days ago, I plan to spend the next 5 days here, savoring the air and exploring the northwest part of the state. So my list will undoubtedly grow. 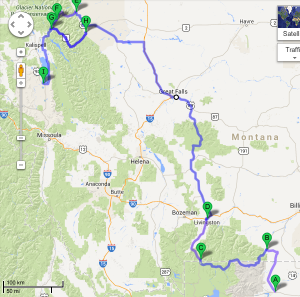 The Montana route map to date is shown at the end of this post. Yellowstone National Park. 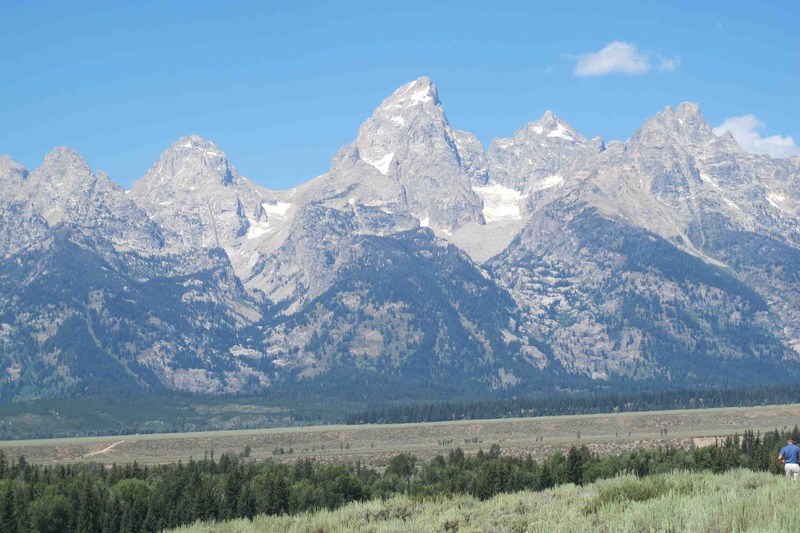 Although mostly in Wyoming, Yellowstone stretches up into Montana. Known for the world’s largest collection of geysers, it also offers spectacular mountain views around each corner, brilliant blue lakes – and wildlife. Be prepared to stop for a bison sauntering up the road in front of you – or gaze at a herd of them and imagine what it must have been like here before Europeans arrived. 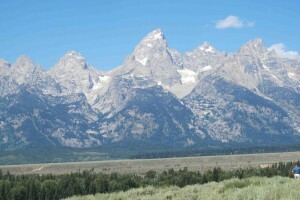 This photo is the Grand Tetons range, actually in WY, leading up into Yellowstone. Beartooth Highway – Straddling 63 miles between Wyoming and Montana, this is a must for the bucket list. I’ve ridden it before and this trip again rode it in both directions, stopping for the night in Red Lodge. 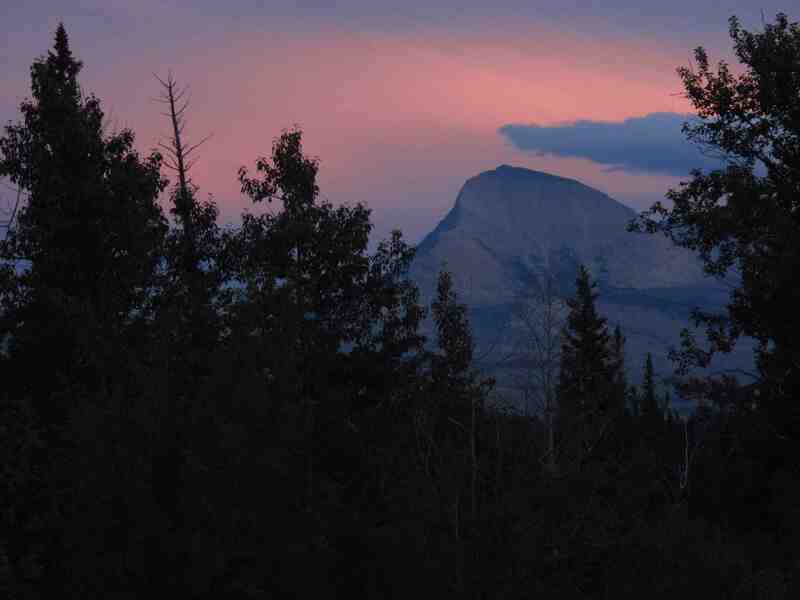 The elevation is actually highest in Wyoming (10,947 feet) and Montana (10,350 feet, but is breathtaking in both states. And you just never know who you’ll meet at the pull-off. When you stop amongst a crowd of bikes and a stranger asks “Are you Liz?” it catches you off guard. By pure coincidence, I’d just met Genevieve Schmitt’s husband Norm and his friend Larry. Red Lodge. 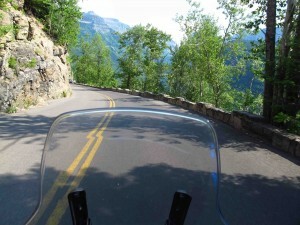 A small western town at the picturesque northern terminus of Beartooth Pass, the shops, restaurants and people welcome riders with open arms. You may arrive alone, but you’d really have to work at not making friends. 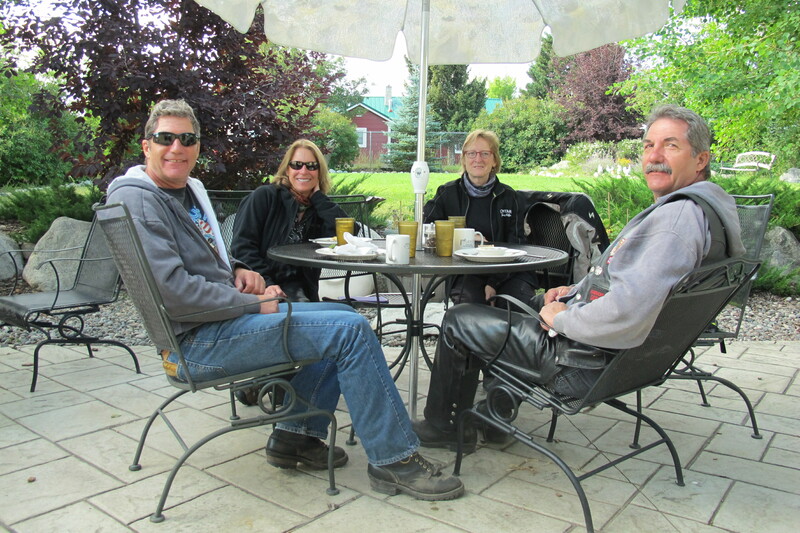 Ann, Jim and John were neighbors in my campground in Cody, WY and by sheer coincidence, again in Red Lodge. Big Blue Sky. I LOVE riding under this sky. 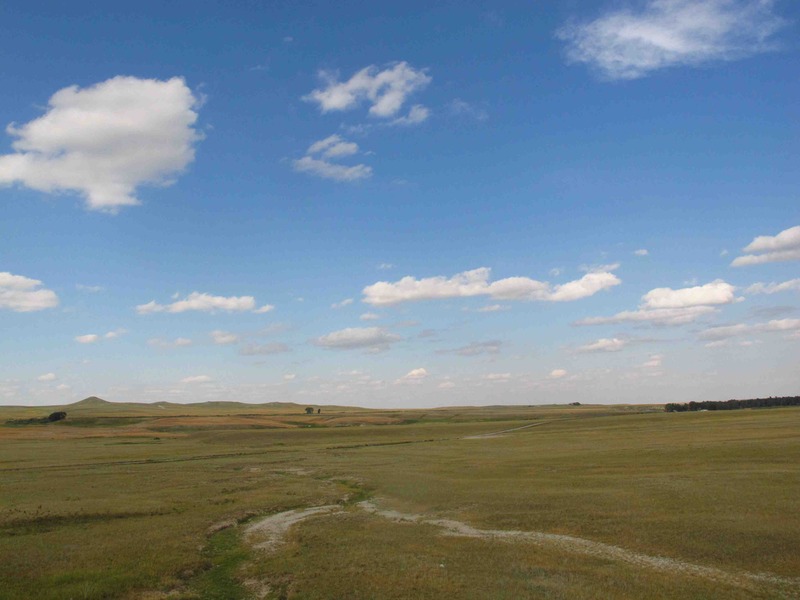 The land is so open and vast, you can see forever in all directions, including up. It may be flat, but there’s a depth and sense of spiritual connection here that is unmistakable. Open Roads. With the vast expanses and low population density, there’s very little traffic outside of major cities. It makes for a relaxing and refreshing long-distance ride. The bugs are pretty big too. 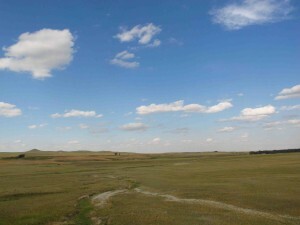 Plains. Without losing focus on riding, it’s easy to imagine how this land looked hundreds of years ago. 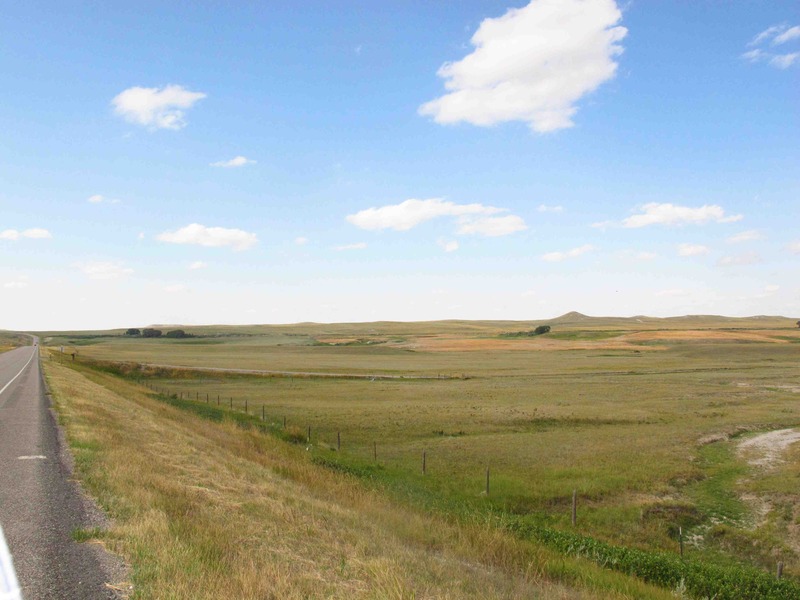 I rode with renewed respect for the Plains Indian, marvelling at their ingenuity to live in harmony and balance with the land and it’s inhabitants for thousands of years. Mountains. While two-thirds of the state may be plains, the rest is majestic mountains, which rise in grandeur from them. They take your breath away, cradle you as you ride their valleys and excite you with twists and turns through the canyons. I enjoyed this sunset from my campsite in St. Mary. Stars. Wide expanses, arid air, clear skies, absence of light pollution and little airborne pollution, make the night sky amazing. The only interference is smoke from forest fires – a regional hazard. When was the last time you clearly saw the Milky Way? 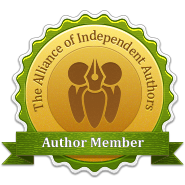 I’ve heard that native Indians referred to them as “campfires of the elders,” – an apt perspective. Glacier National Park. Named for its prominent glacier-carved terrain and remnant glaciers descended from the ice ages of 10,000 years ago, there’s something for everyone here: rugged mountains, pristine forests with a strong pine scent, countless waterfalls, mountain streams, alpine meadows and crystal clear lakes. The 50-mile Going to the Sun Road is a riders delight and although there are steep drop-offs, the real hazard here is brake lights! 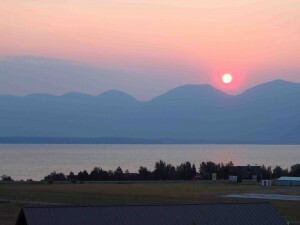 The sunrise pictured here is from my office for the next few days, overlooking Flathead Lake. The sweet cherry harvest from orchards which line it’s eastern shore is just ending. There’s a cool breeze from the lake. The sun is shining. Life is good. From Cody WY, my trip has taken me to Red Lodge across the Beartooth Pass,, back down into WY and Yellowstone, then up historic Highway 89 to St. Mary, Going to the Sun Road through Glacier National Park, spending the night in West Glacier before continuing my circumnavigation of Glacier, back to West Glacier and down the east side of Flathead Lake to Polson, MT. I soooooo agree with the skies – growing up in the incredible flat northern Germany I love it as much as you do! The sunset in St. Mary’s was magical and the Milky Way I can see every night, if I want to, haha! The Bruce Peninsula is very good for that. Girl, how do I envy you! Keep those travel posts coming. I am with you every mile!!!!! Liz I so agree with you on the beauty of Montana. Thanks for reminding me. 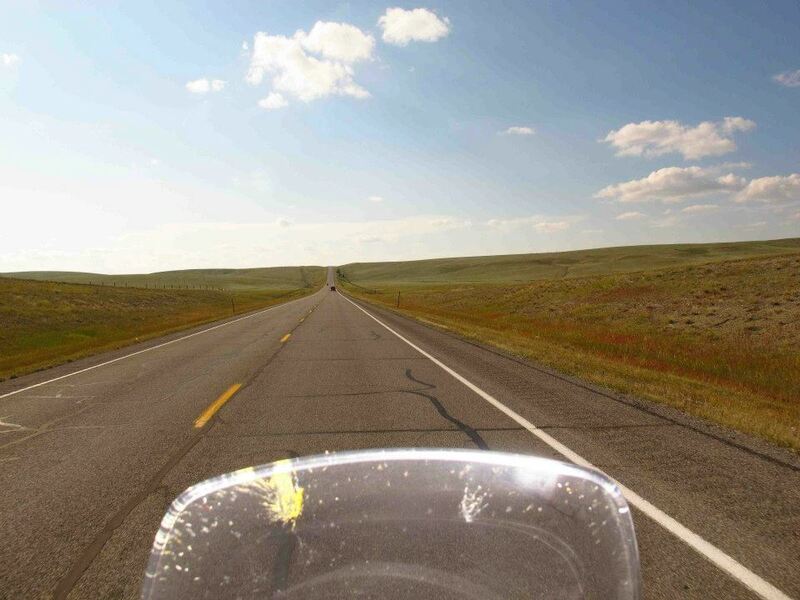 We agree, there are really great reasons to ride in Montana. 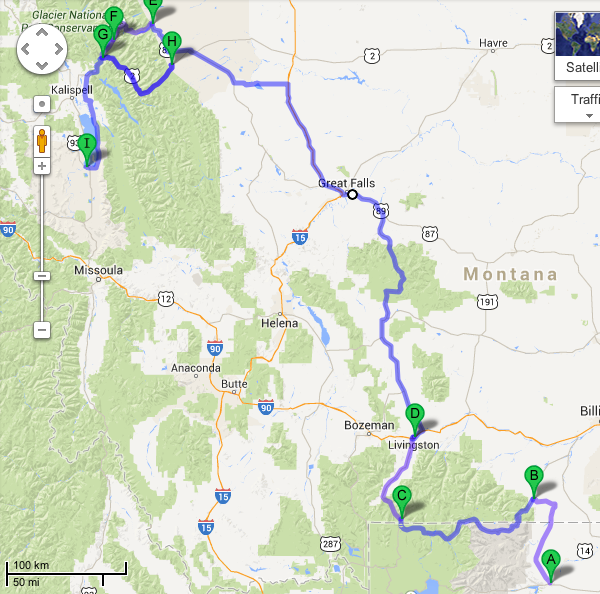 Next time you ride through Montana – try Highway 200 through Sanders County, up 56 to Hwy 2 and then over to Glacier area. OR – many of our guests also like looping around Lake Kookanusa. Thanks for that Katrina. 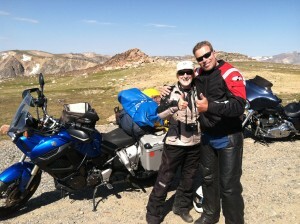 I took Highway 2 from St. East Glacier to Libby – and just finished the loop around Lake Koocanusa today. It’s quite beautiful. Next time I’ll have to try your suggestions! Best success.